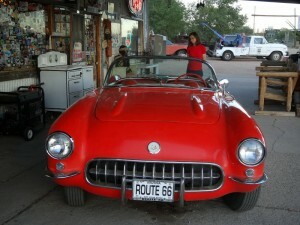 Let me start by saying that I never really understood the obsession surrounding the historic U.S. Route 66. It is well known all around the world as one of the America’s icons. You can buy countless books, posters, calendars, magnets and whatever else you can imagine branded with the Route 66 shield. Somehow I never got too fascinated by it. A couple of years ago I did manage to see and drive some bits of it in Texas and Oklahoma but, to be honest, those stretches didn’t blow my mind away. As I already wrote on this blog, there are so many more interesting and scenic roads in the US. For me the only truly fascinating aspect of this famous route were the small ghost towns along it. One of them was the town of Texola located on the border of (where else) Texas and Oklahoma which I visited in 2011. With only 36 inhabitants (according to a 2010 census) it was practically a ghost town. Many buildings (including a gas station which once served Route 66) were falling apart or were completely overgrown; usually both. A great photo opportunity, but I seriously wondered where these 36 people lived. 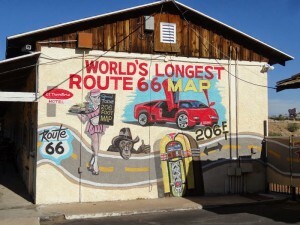 It was a fascinating little place but scarcely a reason to specifically follow the Route 66. So you might find it surprising to learn that during my latest trip to America I actually followed the historic Route 66 for quite long stretches. The reason for that is the simple fact that it was on our route anyway. Basically we had to cross central Arizona along the I-40 corridor which roughly parallels the old Route 66. In fact it in many places it was built right on top of it, completely obliterating the old road. Our first contact with the historic route was in the town of Holbrook, in eastern Arizona, where we stopped overnight after visiting Canyon de Chelly. It is a typical small town which survives by catering mostly to traffic along the interstate. However, there are a few interesting features. One of them is the Historic Navajo County Courthouse and Museum. Built in 1898, the courthouse is now home to the Navajo County Historical Society and is listed on the National Register of Historic Places. It is one of those fascinating small town museums with eclectic and a bit eccentric collections. The other interesting spot in Holbrook, much more connected to the Mother Road, is the Wigwam Motel. One of only three surviving in the whole US it is also listed on the National Register of Historic Places. Built in 1950 it was based on the original Wigwam Village constructed in 1937 by architect Frank Redford in Cave City in Kentucky. It contains fifteen concrete and steel free-standing teepees which are arranged in a semi-circle around the main office. The teepees are painted white with a red zigzag above the doorway and from the distance they actually look quite realistic. 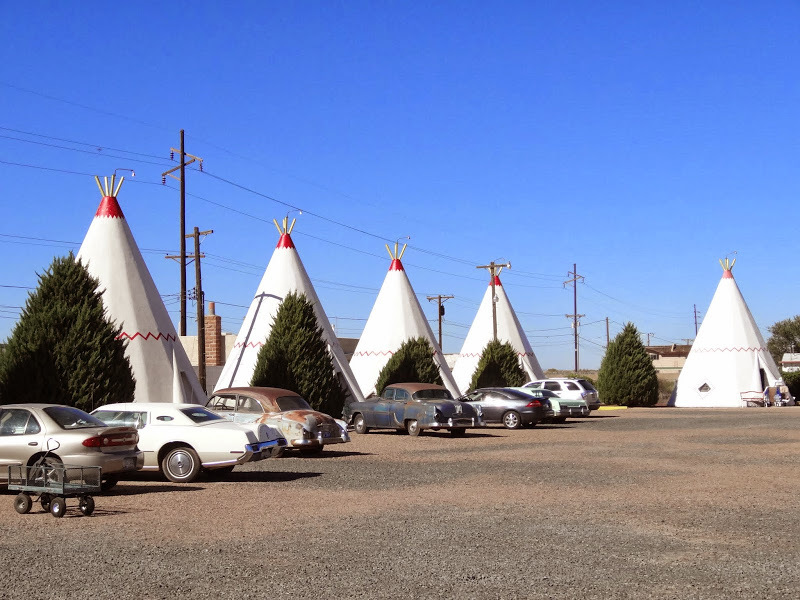 The funny thing is that they named it a Wigwam Motel but they based its design on teepees. I guess the reason for that might be the fact that Wigwam sounds better and is a more recognisable word but teepees look better and most people have them actually in mind when they talk about wigwams. So just to make it clear: wigwams are usually domed, round room dwellings and teepees are the iconic conical tents everyone have in mind when they talk about wigwams. They are completely different things used by different tribes in different regions of America. Anyway, the motel is a great example of the eccentric architecture once common along the Mother Road. Its role was quite simply to attract the passing trade so it was great connection of function and form. I guess that might be part of the attraction of the Route 66, trying to discover these unique buildings, so different from the boring and bland commercial architecture of today. Will anyone, 40 years from now, be driving along the interstates in the search of historic McDonald’s? I doubt it. From Holbrook we headed west following the modern Interstate 40. Our next stop was the famous Barringer Crater. Now, you must have seen it already. Plenty of TV programmes about astronomy, dinosaurs, geology and many other subjects featured this place at one time or another. I have seen it on quite a few BBC shows, on Polish TV and of course in many Hollywood productions. The reason for that is quite simple: it is a stunning site. 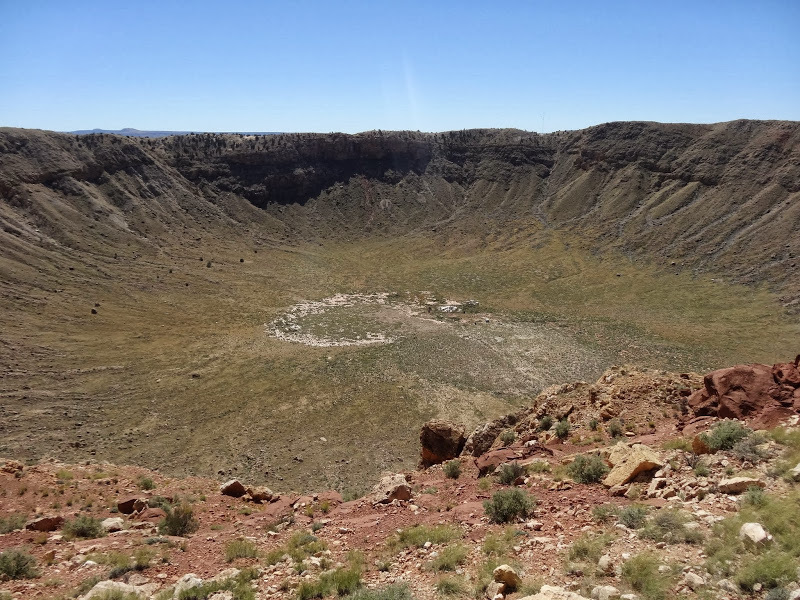 Being only about 50,000 years old the crater is well preserved, especially in the arid climate of Arizona. Even if, as I mentioned already, it is highly likely that you have seen it on TV, it is still well worth a visit. The admission price of $16 is quite steep but it includes a quite informative guided tour along the rim. I only wish for it to be a bit longer than the current few hundred meters. It was my second visit to the crater and I would happily go again, there is something magical in seeing how fragile our planet really is. One small piece of rock from space (the meteorite which created this large crater was only about 50m in diameter) can do so much damage. From the crater we headed west again. 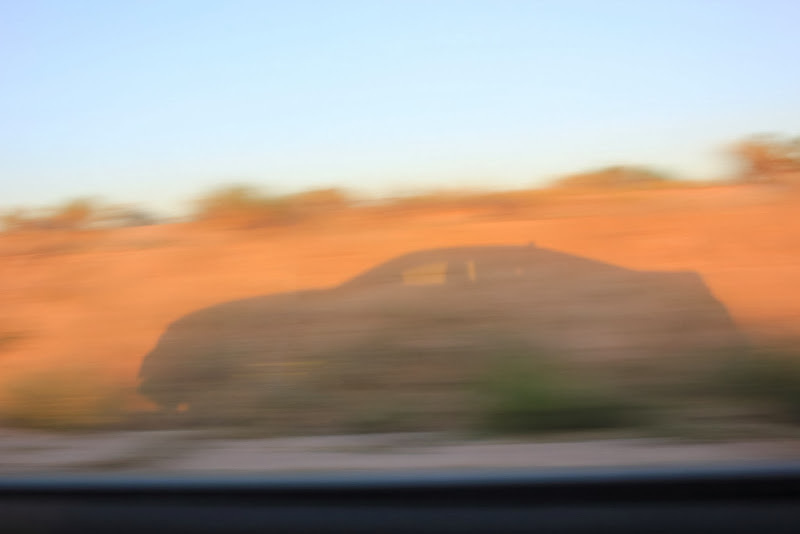 For 120 miles we were ploughing the interstate across the huge landscapes of central Arizona. I love driving interstates. I know, it can get boring, but there is something magical in those big open roads carrying people from across the whole country. Truckers carrying goods, students heading to distant colleges, people moving to new jobs, families on vacations, European travellers like us. For hundreds and thousands of miles, relentless, non-stop movement. Still, the biggest draw here are the small towns along the way. 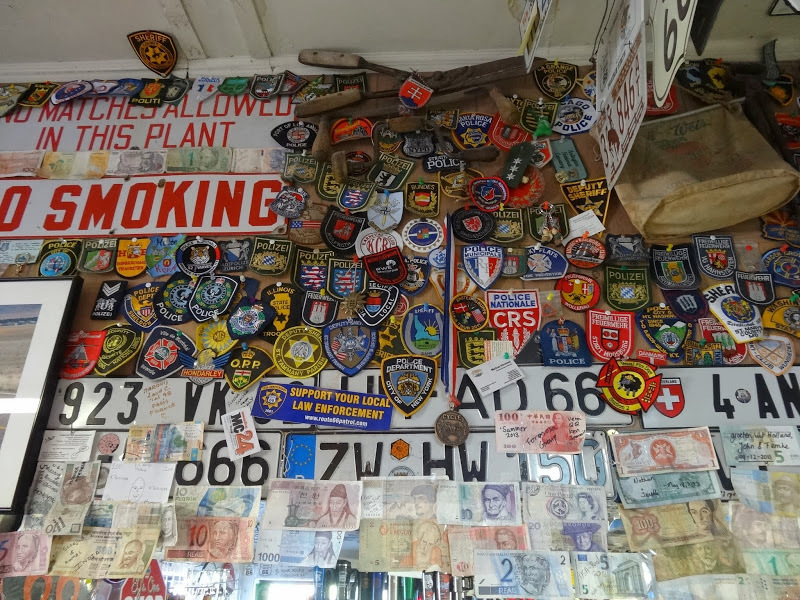 In Seligman itself there are quite a few old-school roadside stores selling all sorts of Route 66 paraphernalia as well as food, drinks and snacks. One of them is the famous historic eatery, build in 1953, Delgadillo’s Snow Cap Drive-In. 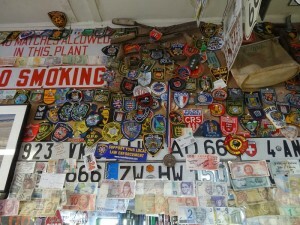 Most of these places allow travellers to put stickers or little notes on the walls. It offers great insight to who is actually passing through this small town (and others along the route). A lot of travellers seem to come from automobile clubs from Europe, especially from Germany. I don’t know why but it seems that Germans love the US. I always meet plenty of them along my travels across the America, especially in the western half of the country. Way more than any other European nation (maybe with the exception of Brits). It is also interesting to see how Asians leave personal business cards pin to the walls rather than stickers. There are thousands of them on the walls of local establishments. 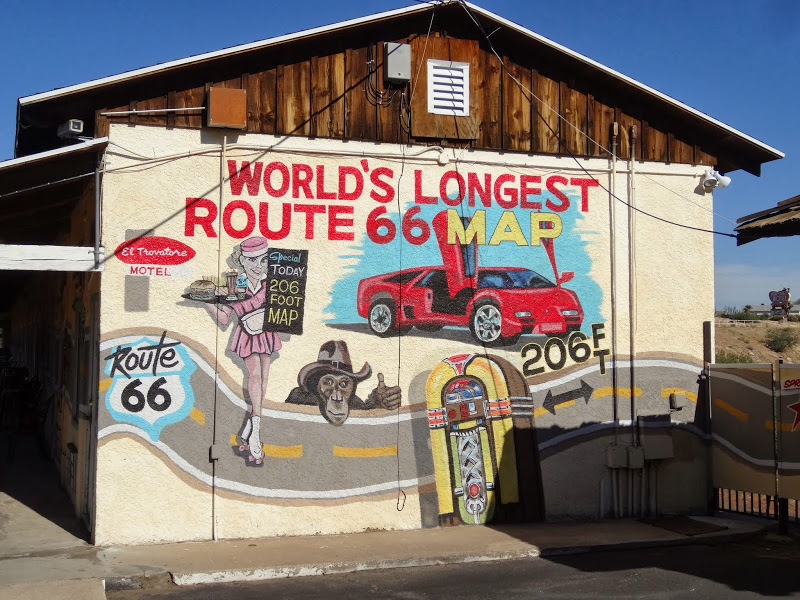 If Seligman is small but still viable town serving the traffic on the interstate our next stop, tiny Hackberry, was a real throwback to the old Route 66. 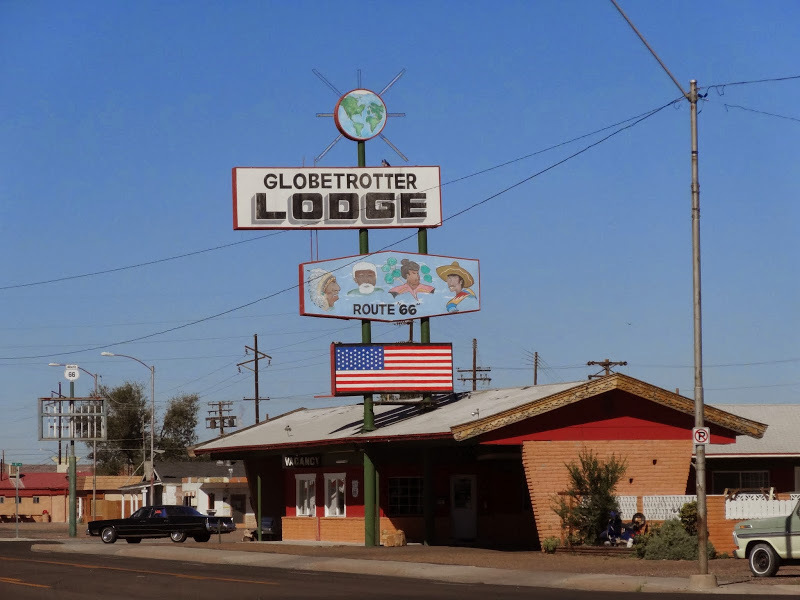 Located 60 miles to the west, far from the modern interstate (as here Route 66 diverges quite a lot from the I-40) it is really just a collection of shacks. Its local grocery store and its Conoco station were among the last to close, in 1978, and it became a ghost town. Then, in 1992, artist Bob Waldmire re-opened the Hackberry General Store as a Route 66 tourism information post and souvenir shop on the former grocery store site. At one point, he was the only resident in town. There is a small collection of old vintage cars parked around the store and the place seemed to be booming. It probably helped that during our visit all the national parks in the US were closed due to the federal government shut-down. Folks heading to the Grand Canyon had to find something else to do and it looked like many of them chose driving Route 66. We spent the night in the town of Kingman back on the interstate 40. As we arrived late we stayed in another unremarkable chain motel. Thousands of them line all the interstates. The next morning we realised that the neighbouring property was a cool looking old-school El Trovatore motel which claims to have the world’s longest Route 66 map. Now, I don’t know if that’s true but the map which is running along the whole length of the motel building is quite impressive. A must see for a map geek. Pity we didn’t stay there. While in Kingman we also visited an interesting Route 66 Museum located in renovated historical powerhouse building. The museum depicts the historical evolution of travel along the 35th parallel that became Route 66. Among the displays there are dioramas, murals, vintage clothing and a 1950 Studebaker. But the most interesting aspects of the museum are related to the post-Drought/Depression rush to California, including reproductions of the old photographs showing poverty and desperation of the migrants. Some of the best were taken by Dorothea Lange for the U.S. Farm Security Administration (FSA) investigating living conditions of farm workers and their families in Western states. Among them is the famous Mother of Seven Children, Age Thirty-two, taken in 1936 in California. 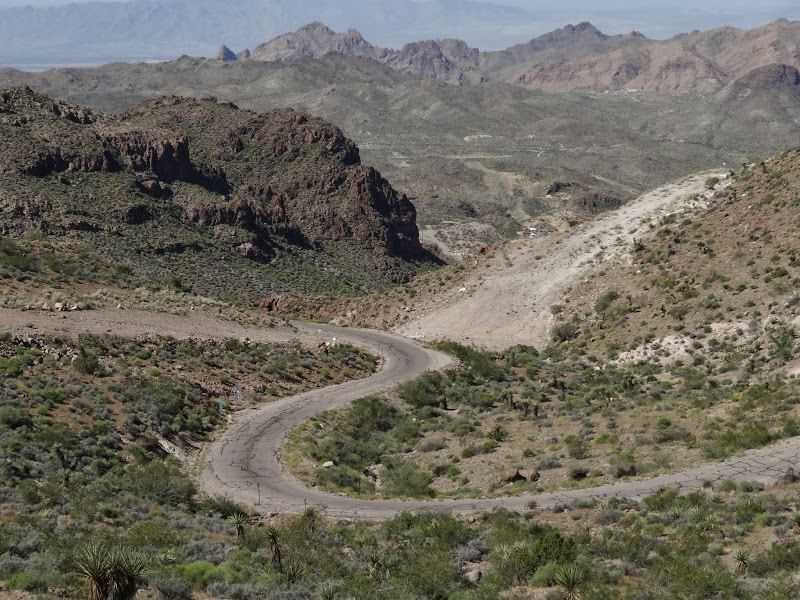 West of Kingman Route 66 diverges from the interstate again and becomes Oatman Rd. 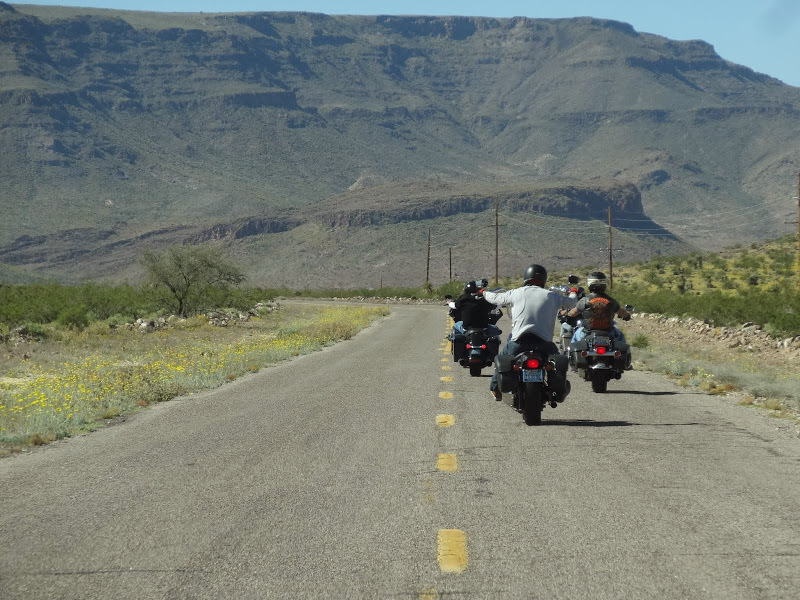 This is probably one of the most scenic bits of the whole Mother Road as the route climbs to the 3550 feet Sitgreaves Pass, offering great views all around, especially from the scenic pull-off right at the top of the pass. 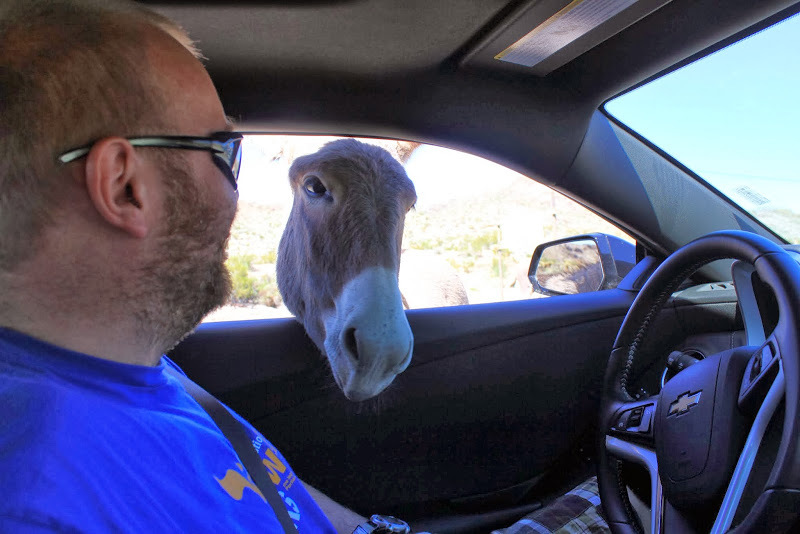 A few miles west of the pass is located the small but fascinating town of Oatman. It is one of those places which went through many transformations. It was at some point a gold mining town, a busy Route 66 service centre and a ghost town before becoming a tourist destination. It has undergone an amazing renaissance thanks to burgeoning worldwide interest in the Mother Road. It was clearly visible during our visit with bus-loads of French and German tourists descending upon town. Locals even stage a “shootout” at certain times of day to cater to all the traffic. On one hand it is quite fun but on the other hand it feels quite kitschy and it must be sad when the only way to survive is to become like a Disneyland. Still, the main attraction here are the “wild” burros, which are in fact experienced beggars. The donkeys are descended from pack animals turned loose by early prospectors, and are protected by the US Department of the Interior. In search of food two of them even stuck their heads into our car. After a detour to see the London Bridge (yes! more about it the next time) we joined the I-40 and headed to California. We were not planning it but due to missing some turns on the detour along the interstate we found ourselves on one of the remotest stretches of the famous route. It was somewhere between the exit 107 on the I-40 and the US Hwy 95 leading to Las Vegas. Here there were no tacky tourist shops, no fun burger joints, no tour buses, not even cars. Just beautiful Mojave desert, a few ruins (with even fewer standing structures) and post boxes in the middle of nowhere (so, there must be some people living somewhere out there). Add a glorious sunset and you get the picture. This entry was posted in Uncategorized and tagged Arizona, Barringer Crater, Hackberry, Hollbrook, Kingman, meteor crater, Oatman, Route 66, Seligman, Sitgreaves Pass on March 10, 2014 by admin.